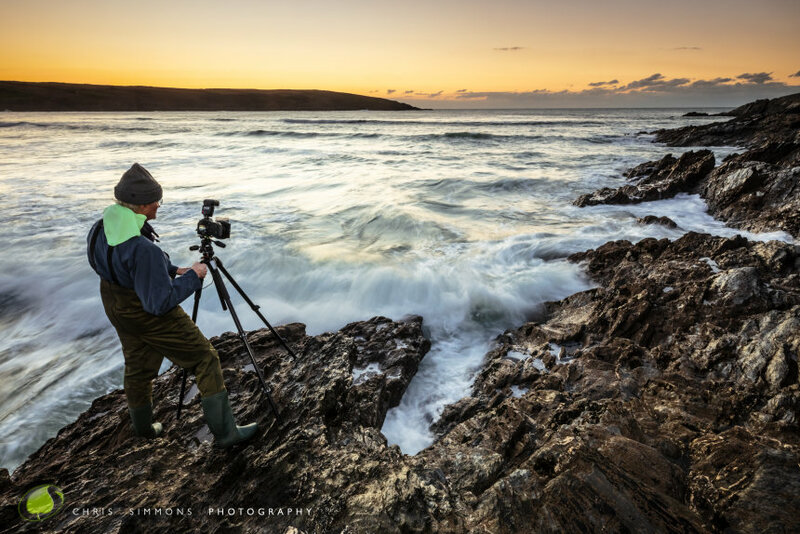 Andrew shoots a sundown on Crantock ledge. Thank you, both of you, for a spectacular three days. Your hospitality was much appreciated. I felt at ease from the start, a great help in combatting the initial nerves when embarking on my first ever photography workshop. Now reviewing the images I am still blown away by the quality. Your local knowledge brought me to the perfect locations at the right time for tide, wave height and light conditions. I very much appreciated your teaching style. You were not crawling all over me. Your approach seemed to be more on the lines of ‘If he looks comfortable with what he is doing, just give a few guiding hints and let him get on with it’. But you were always on hand for advice. This led to an even greater sense of achievement when I did get it right, and the opportunity to learn from the mistakes when we were back in the studio. The shoots have resulted in me having far more confidence in the use of my equipment, filters, flash etc. The use of flash in daylight was a revelation to me! Back in your studio, it was interesting to see your approach to post-processing. I am not sure I shall be able to wean myself completely off Lightroom as my import, cataloguing and raw conversion vehicle, but you have certainly persuaded me to make greater use of Photoshop thereafter. In particular I look forward to reworking some of my earlier raw files with your bespoke post processes. All in all it was an invaluable three days. Also it would be remiss of me not to mention the outstanding food provided.